As a visitor, want to experience kayaking discover Halong Bay, you can join the tour overnight on the bay with luxury yachts. 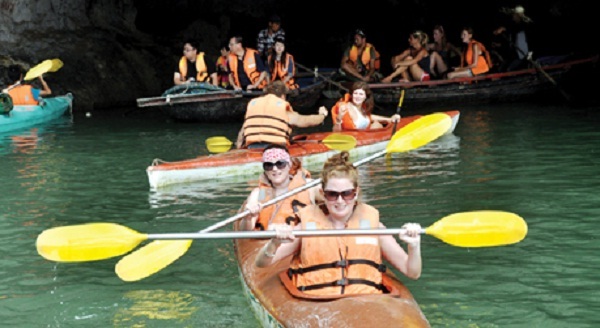 Since this is an operation in overnight tours, most cruise ships are equipped to give tourist kayak tours explore in the area, beautiful and safe place. Specifically, as JSC Yacht Indochina owns a fleet of luxury overnight on the bay. 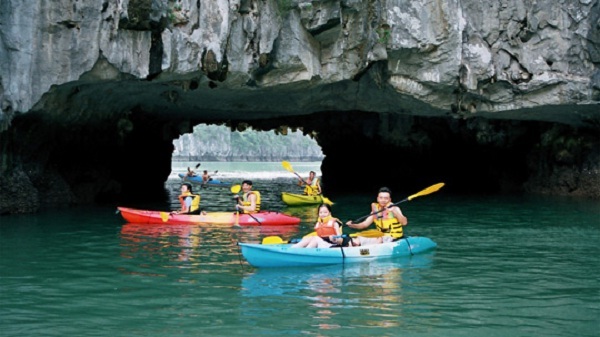 Currently, the company has about 60 kayak service for tourists and tour groups in the area Hang Co … On the other hand, to Halong Bay, you can take the train to destinations such as Ti Top Island, Sot cave, Bo Nau, etc. In Vung Vieng fishing village, there are kayak rentals, you’ll get the kayaks hired himself a pleasant, for about 150 thousand dong / hour. Especially when the tour on the bay overnight tourists enjoy quiet atmosphere at sea ended our experience back on the yacht most people are excited and happy because you have an exciting experience. In the afternoon on the yacht as well as exciting period for the visitors, prepare for dinner the chef has prepared the ingredients include meat rolls, vermicelli, black mushrooms, carrots, spices, eggs chicken and rice paper guide visitors make traditional cakes all the people of Vietnam .